An article in the Peninsula Gateway that comes out of Gig Harbor in Washington State describes the work that Harbor Montessori students are doing with the Amman Imman project. They've discovered wonderful ways to raise money for Amman Imman's work, spread awareness about the Azawak, and teach children values about being a global citizen while at the same time helping students become more conscious of their daily water usage. Reading the article reminded me of the connection between the Amman Imman project and the values inherent in Montessori philosophy. As expressed by Harbor Montessori principal Sonya Carey, "the project touches on all four pillars of a Montessori education: passion for excellence, global understanding, universal values and a culture of service. The students have learned about African culture while also understanding the impact of volunteerism." When Harbor Montessori principal Sonya Carey first heard about the Amman Imman Water Project last April, she saw an opportunity to help children in need. “The water (in Niger) is as dark as or darker than the color of hot chocolate,” said Claire Goston, a fourth-grader at Harbor Montessori who is part of the project. Carey said the project has also become an opportunity for students like Goston to learn both about a foreign country and about themselves. “The children gain confidence and self-esteem by making a difference,” said Carey, who has been principal at Harbor Montessori for seven years. The project is simple enough: All upper elementary and middle school students at Harbor Montessori have an empty water bottle that they carry with them. Whenever they use water — by drinking, washing their hands or flushing a toilet, for example — they drop a coin into the bottle. 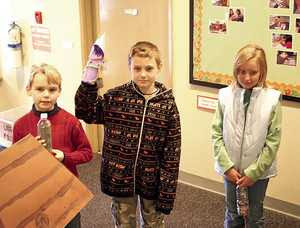 Once a week, the students empty their bottles into a cardboard well kept in the school’s lobby. On Earth Day, Carey will open the well and the money will be donated the Amman Imman Project. The students also raised money by selling pizza and concessions at Family Bingo Night in October; they will do the same at Family Craft Night next month. Carey feels that the project touches on all four pillars of a Montessori education: passion for excellence, global understanding, universal values and a culture of service. The students have learned about African culture while also understanding the impact of volunteerism. “Nigeria is the poorest country in the world,” fourth-grader Joseph Tarabochia said about what he learned from the project. “They ride donkeys to get water and the children have to get their own water,” added 9-year-old Carter Asay. Some students admit it is hard to remember to always drop a coin in their bottles each time they use water, but they agree that what they like most about the project is helping others. “We can make a difference for the Africans,” said Jonathan Brown, a fifth-grade student. The fourth- and fifth-grade students were so enthusiastic about the project, Carey said, that they are giving a PowerPoint presentation about Amman Imman to the Rotary Club next month. Neither Carey nor the students are sure how much money they have raised, since they will not open the well until April. The students guess between $20 and $60. The Amman Imman project is only one of many service projects that Harbor Montessori students are involved in. For Valentine’s Day, students will make and deliver Valentines cards to seniors at retirement homes throughout the community. “The big thing in Montessori education is developing that culture of service plus global understanding,” Carey said.